Did someone say bottomless mimosas? Every Sunday the Brixton’s brunch offers endless mimosas ($18/2 hour limit) with any brunch item. 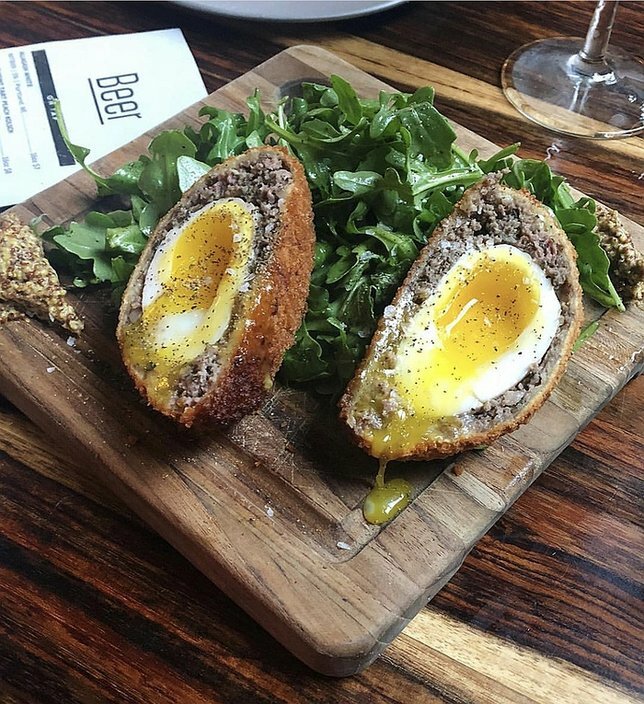 With menu staples like their eggs benny of the day (served with sweet potato hash) to unique dishes like their duck scotch egg (soft boiled egg, duck sausage, grain mustard over arugula) you can’t can wrong with their impressive selection. Other favorites are their breakfast poutine and banana bacon pancakes. Make sure to call ahead for reservations. When brunch cravings call for Tex-Mex, head to Del Fuego. A special taco brunch ($16) is offered every Sunday with a complimentary Bloody Mary, mimosa or Michelada Del Fuego. Diners can choose from any three tacos all served in a flour tortilla with a side of fresh fruit. We recommend trying their signature chorizo taco (scrambled eggs, spicy sausage, pickled red onion, pico de Gallo and guacamole) or their BLT taco (scrambled eggs, crispy smoked bacon, shredded lettuce, diced tomatoes and crema). And for sipping? Cheers to the weekend with their Señor Palmer (pineapple infused tequila, house made lemonade and fresh brewed iced tea). Argyle Grill’s ala carte Sunday brunch is offered from 12-4 p.m. with $5 sangria, mimosas and Bloody Marys. The a la carte menu has tons of breakfast favorites including fresh made omelets, tasty wraps, crispy home fries and breakfast sausage. Argyle’s casual setting is perfect for meeting with friends or bringing the whole family. When it comes to brunch classics, Glen’s Dinette is cooking up all of the favorites. Served all day, 7-days a week, diners can’t go wrong with their famous hash and eggs, banana pecan French toast or huveos rancheros. The space is warm, inviting and transports visitors back to the 1950s with retro burgundy booths and eclectic décor. Tres Palms serves up Fire Side on the Bay Brunch every Sunday from 11 a.m.-2 p.m. With fresh made egg dishes like their signature Lobster Omelet (fresh Maine lobster, bacon, jack and cheddar cheese, roasted potatoes) to their breakfast burrito (scrambled eggs, bacon, jack and cheddar cheese, pico de Gallo, sour cream and potatoes). And for those who prefer something on the sweeter side, we recommend going for their pancake stack, your pick of fresh blueberries or chocolate chips. All brunch dishes are served with your choice of a complimentary mimosa or Bloody Mary. Kick Off Summer with these Hot Deals! Subject: LongIsland.com - Your Name sent you Article details of "These Five Restaurants Serve Up Some Delicious Brunch in Babylon"